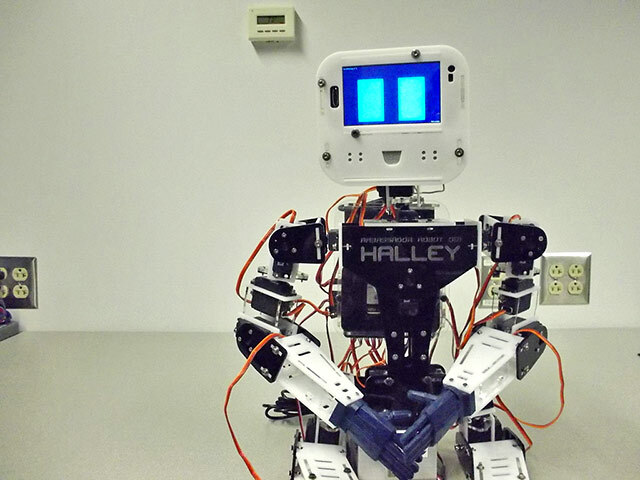 Halley, Ambassador Robot is a 2.6-foot remote-operated humanoid robot designed to be capable of emulating human communication. It is also designed to be able to attend university lectures. Sophomore John Choi developed Halley as a proxy for himself, capable of attending and recording university lectures. Choi, keen to share his creations with a wider audience of makers, has placed all source files for Halley on GitHub (licensed under GNU GPL), and has written an extensive Instructable detailing how to construct Halley for around $500-800. Additional photos of the project can be found in this Flickr photoset. Halley was built for the purpose of exploring what it means to be human from a non-human perspective. The primary means of achieving this is through human-robot interaction, where the robot, Halley, emulates as many human functions as possible while interfacing with another person. In order to connect with the idea of being human, a humanoid shape of respectable size is deemed necessary, along with an array of face-to-face communication techniques. A speaker, camera, and microphone satisfies the need for basic sensory input and output. 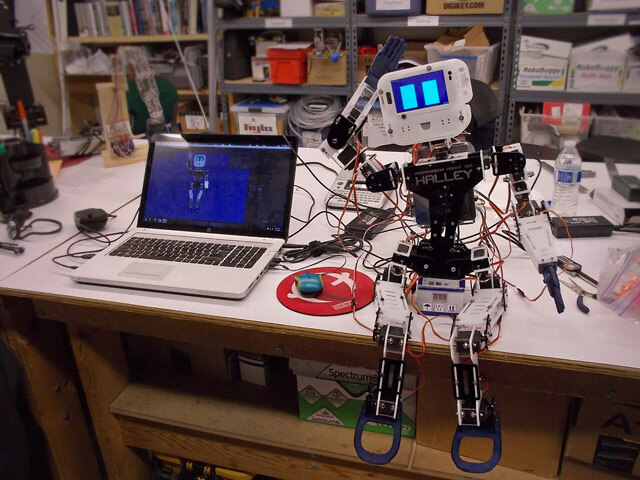 Gestures, such as raising hands to ask questions, are supported by Halley’s movable arms and legs. Finally, and perhaps most importantly, the ability to express emotions will be achieved through the clever use of an Android phone as a face. The ultimate goal for this project is to have Halley take the place of a student in a classroom. The Halley Instructable has received more than 23,000 views. Choi writes: Comments and private messages tell me that graduate students and even a tech professor at various institutions have taken interest in this project. In addition, the Poppy Project, a team of roboticists in France who have inspired my work, were quite impressed by this project, even to the point that they wanted to merge my contributions with theirs! Halley, Ambassador Robot was developed in the CMU Robotics Club workshop, and was supported by a microgrant from the Frank-Ratchye Fund for Art @ the Frontier (FRFAF) — an endowment founded to encourage the creation of innovative artworks by the faculty, students and staff of Carnegie Mellon University. With this fund, the STUDIO seeks to develop a cache of groundbreaking projects created at CMU — works that can be described as “thinking at the edges” of the intersection of disciplines. John Choi is a sophomore studying in CMU’s Bachelor of Computer Science and Art (BCSA) degree program.